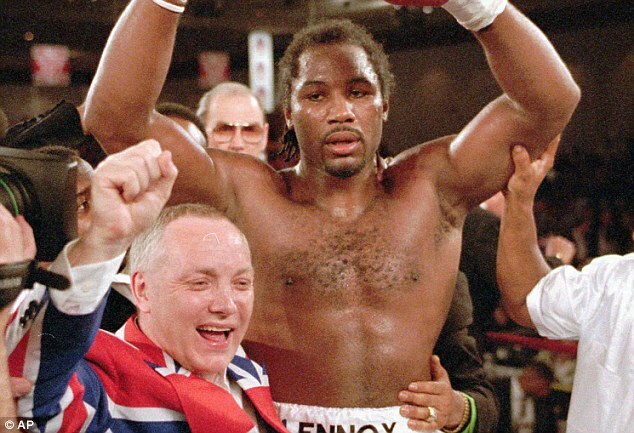 Lennox Lewis celebrates after his unusual victory. Lennox Lewis has revealed which fighter in the current crop of heavyweights he believes would have given him the most trouble. The 53-year-old former undisputed heavy champion and Olympic gold medallist has weighed up the credentials of unified heavyweight champion Anthony Joshua 22-0 (21), WBC titleholder Deontay Wilder 40-0-1 (39) and former lineal heavyweight champion Tyson Fury 27-0-1 (19). Lewis says that Fury’s sheer size – listed as an imposing 6-foot-9 with an average fighting weight of 260-pounds – would be most problematic for him. “I think those fights would’ve been great because when I was around it was a lack of big guys,” Lewis told The Mirror. “All of a sudden I’m retired now and they come out of the woodwork, there’s tons of them. Lewis insisted that despite Fury’s physical dimensions, he would have found a way to defeat him. “I would break him down probably by the 10th round, I would break him down. But, he would give me some problems,” Lewis admitted. During his storied career through the late 1990s to early 2000s Lewis fought a who’s who of the heavyweight division, defeating Evander Holyfield, Ray Mercer, Tommy Morrison, Razor Ruddock and Mike Tyson. Lewis retired in 2003 after defeating Vitali Klitschko on cuts with a record of 41 victories, two losses and a draw. Thirty-two of his victories came within the distance. Lewis avenged both losses on his ledger with knockouts of Oliver McCall and Hasim Rahman in rematches. Meanwhile Fury’s next bout is still up in the air after signing a broadcast deal with ESPN. The self-styled ‘Gypsy King’ was widely expect to head into an immediate rematch with Wilder, who is currently in negotiations with regular broadcast partner Showtime and new US entrant DAZN.